Ocean Plastic is a huge problem. How huge? How about 12.7 million tons a year? And it’s not only polluting water and beaches. It’s poisoning ocean life at all levels. In addition, it’s finding its way back onto our dinner plates. The German shoe company Adidas has come up with one solution. And it’s making some headway. What do you think happens to plastic waste after you put it in the trash? If you live in an area with curbside recycling, some of it gets used again. But, according to National Geographic, 91 percent of plastic waste is not recycled. What happens to it? A lot of it — 12.7 million tons a year — finds its way into oceans. That’s one garbage truck full every minute, all around the world. Plastic is turning up where we might least expect it. On beaches, even embedded in arctic ice. Sea animals are getting tangled up in bags and trapped in the rings that hold six packs together. In addition, all along the food chain, from the smallest plankton to the largest whales, animals are ingesting plastic and dying. And it’s coming back to us in the form of contaminated fish and seafood. If that’s not enough, there is a floating island of plastic the size of Mexico (and one hundred feet deep) in the Pacific Ocean. And it’s not the only one. According to the Plastic Soup Foundation, if we keep polluting at this rate, by 2050, the oceans will contain more plastic than fish. The German shoe company Adidas partnered with the ocean activist organization Parley to brainstorm a solution. What they came up with was this: a shoe made from ocean plastic. And people love it. 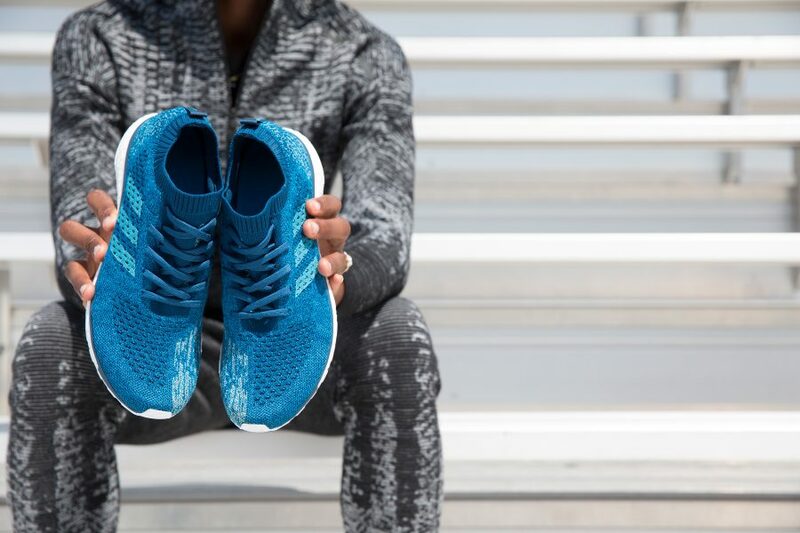 According to Adidas, the company sold one million pairs of its ocean plastic Ultraboost running shoes in 2017. First, Adidas gathered ocean plastic from beaches and shores. Then Parley developed a technique for creating the plastic yarn used to make the shoes. The result was three new versions of Adidas’s fashionable and popular Ultraboost running shoes. And they’re off to a fast start. Adidas debuted the shoe at the 2017 IAAF World Championships. 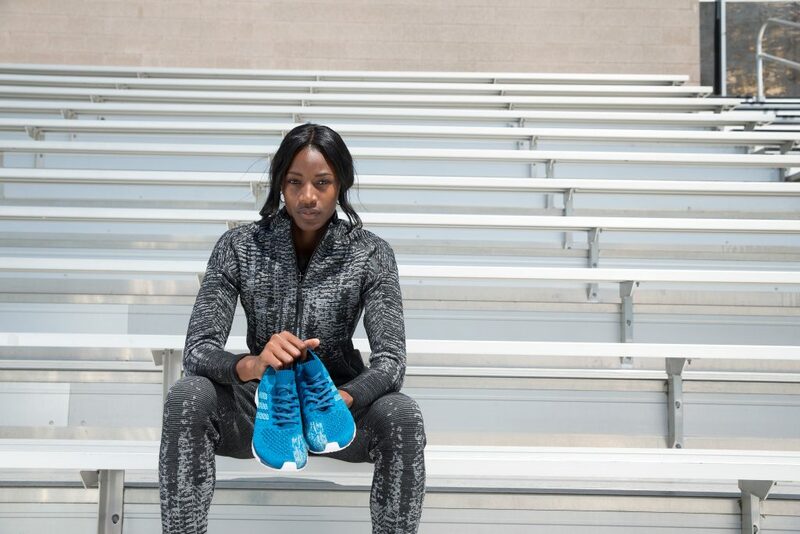 Olympic champions Shaunae Miller-Uibo and Wayde Van Niekerk wore the shoes during their own competitions. And both athletes made it to the finals and onto the podium. Van Niekerk took gold in the men’s 400m, and Miller-Zibo won 3rd place in the women’s 200m. 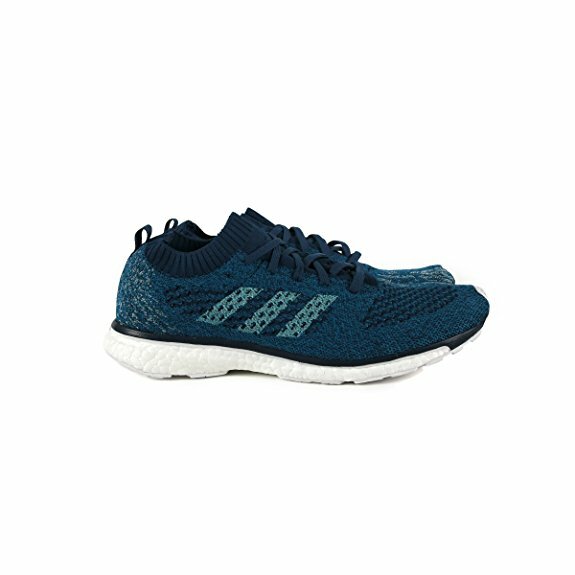 Each pair of special Parley Ultraboost shoes contains the equivalent of eleven plastic bottles. That’s plastic that is no longer polluting the ocean and harming wildlife. Following on the success of the shoes, Adidas and Parley have created a gorgeous line of athletic wear for men and women, also spun from ocean plastic. From swimsuits to Yoga wear, it’s reasonably priced and comes in a great selection of colors. Other companies have started to harvest ocean plastic to make their products. The startup company Bureo began with the goal of reducing ocean plastic, rather than producing products. Bureo uses discarded fishing nets to create a stunning line of recycled plastic skateboards, as well as recycled plastic sunglasses. Bionic Yarn spins ocean plastic into thread and yarn. They sell their products to major clothing companies, including Timberland, O’Neill, H&M, and The Gap. Some of the clothes you’re wearing right now may include thread and yard made from ocean plastic. Discarded fishing nets are figuring big into another company’s work. NetWorks, in partnership with the Zoological Society of London, uses them to create carpet tile. In addition, Net Works partners with community banks in fishing areas to fund local conservation projects. The banks also organize beach clean ups and provide other services. Since 2012, Net-Works has collected 142 metric tons of plastic waste, and given 1,500 families access to finance. In addition, computer giant Dell, which has been using recycled plastics in its computers since 2008, has begun to work with ocean bound plastics as well. As has bicycle manufacturer TREK. And a host of other companies. Buying sustainable products is a start, but it’s not enough. One of the most important parts of the reduce – reuse – recycle formula is reducing. If you want to reduce ocean plastic, stop buying products that create it. Avoid products with excessive plastic packaging. Look for products that use recycled plastics. And before you throw plastics in the trash, first, think if there’s any way you can reuse it. In addition, you can participate in, or even organize a beach cleanup. This is an excellent activity for school groups, scouting groups, or even a group of friends. You can also support groups that work for cleaner oceans. These include the Ocean Conservancy, the Plastic Pollution Coalition, and the Plastic Soup Foundation. Ocean plastic has created a terrible problem. Innovative companies are working toward solutions. But we all need to pull together.